These small lapel pins are beloved all over the world. 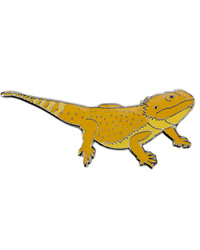 They are drawn by experts in the reptile scene and stamped from solid iron with silver or gold plating. Crafted in multicoloured soft enamel and sealed with an epoxy coat, thease beautiful pins come with a butterfly clutch. Size 35 x 14 mm. "Thanks for your excellent service, the frozen mice were very well packed. I will certainly use you again, you're the best reptile supplier online."